LEMIS IBR, a joint project between the Louisiana Commission on Law Enforcement (LCLE) and the Louisiana Sheriffs’ Association (LSA), provides FREE OF COST software and support to all Louisiana law enforcement agencies. No software license is required and there is no database software to purchase. LEMIS is built to operate on modern Windows-based computer operating systems. LEMIS IBR is developed and supported by state and federal funding and is provided to all Louisiana law enforcement agencies. Technical support is available during normal business hours. LCLE and LSA continually upgrade LEMIS IBR with new functionality requested by user agencies that adapt to evolving state and federal requirements. 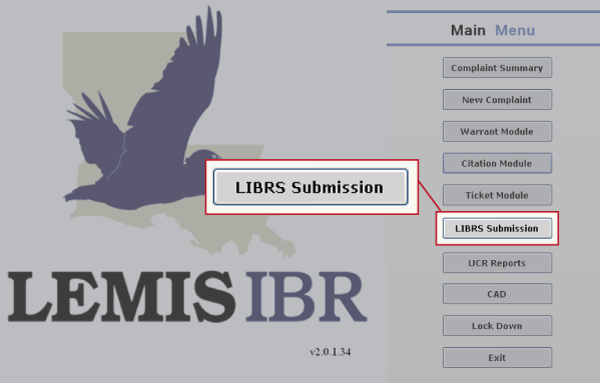 Ability for LEMIS IBR users to select NIBRS code in offences where the LRS code relates to multiple NIBRS offense codes. This gives the agency greater control over how the data is reported in statistical analysis. Ability for LEMIS IBR users to generate the following LUCR summary reports from within IBR: ASRA, ASRJ, Return A, Supplement to Return A, Supplementary Homicide, LEOKA, Quarterly Hate Crime, Monthly Arson Offense, and Human Trafficking. The generation of the LUCR reports uses the LIBRS validations allowing only validated incident data into the reports. Incidents not included in counts will display on second page of each report. This will aid LEMIS agencies transitioning from LUCR to LIBRS. Ability for LEMIS IBR users reporting into UCR online to generate an XML file that can be imported into UCR online. This saves time and data entry errors for agencies.